The temperate Southern California climate makes it a popular tourist destination and the ideal place to operate a theme park. Some of the more popular amusement parks in Southern California include: Sea World in San Diego, Disneyland and Disney’s California Adventure in Anaheim, Knott’s Berry Farm in Buena Park, Six Flags Magic Mountain in Valencia, Six Flags Hurricane Harbor in Los Angeles, and Universal Studios in Hollywood. Injuries in these types of theme parks most commonly occur on roller coaster rides and on water slides. There is a multitude of other types of negligence that can occur. Amusement parks keep staff and maintenance crews at a minimum in an effort to rake in profits. This increases the chance of injury to unsuspecting innocent victims who visit the park with the assumption that the park has spared no expense to ensure their safety. If you ore a loved one has been injured in a theme park or amusement park in Southern California, you need an aggressive attorney who specializes in these legal matters. A roller coaster accident is a serious matter that can cause life altering. These types of incidents are more commonplace than you may think. You just do not hear about them because the theme parks attempt to settle quickly in exchange for keeping the matter silent, often under a confidentiality clause. When the general public hears about a roller coaster accident, theme park sales suffer. Southern California amusement parks such as Sea World, Six Flags Magic Mountain, Knott’s Berry Farm, and Disneyland have a huge incentive to limit the publicity of theme park malfunctions and disasters. When roller coasters malfunction to the point of that people suffer serious injuries, it usually means that somebody was negligent or that one or more parts of the rollercoaster were defectively manufactured. A common form of negligence is negligent maintenance or negligent supervision of the operations of the coaster carts and tracks. The most common causes of accidents, when they occur, are operator negligence and negligence maintenance of the tracks by maintenance and safety crews. This can lead to derailment of a coaster cart, or a piece of the cart breaking off and landing on someone’s head, causing a head injury to a bystander standing below. Another common cause of accidents is defectively manufactured parts or faulty seat belts or safety harnesses. Defective or faulty safety belts could break loose, causing a passenger to fall out of a coaster cart, suffering serious bodily injury or falling to their death. If you have suffered serious bodily injury in a roller coaster accident, a San Diego bodily injury attorney at Injury Law Group can help you hold the theme park or ride operator accountable. Falling debris and metal parts from a coaster cart or coaster tracks are very dangerous because in addition to causing serious bodily injury, the falling parts are likely to fall on an innocent victim’s head, causing serious head injuries or brain trauma. If your family member has suffered brain trauma as the result of a roller coaster accident, a brain injury lawyer can help your family obtain the treatment you need and recovery financial compensation for your family’s pain and suffering. If you or a family member has been injured in a roller coaster accident at an amusement park, an experienced California roller coaster accident lawyer can help you hold the amusement park accountable. We understand the practices and motives of amusement parks and we have the knowledge and knowhow to make sure that your medical bills are promptly paid for and that you receive the maximum compensation for your pain and suffering, lost wages, and other damages. 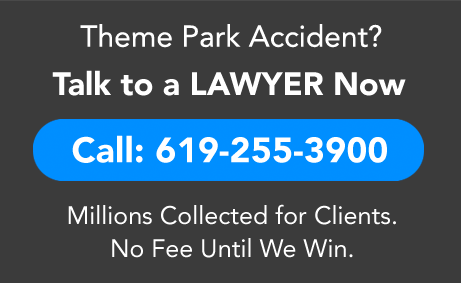 The big amusement parks and theme parks will spend hundreds of thousands of dollars, if not millions, to defend against your claim for injuries resulting from an accident at an amusement park. You need a dedicated injury attorney who is willing to fight for your legal rights even in the face of a strong opposition, to ensure that you and your family are protected and receive justice and the maximum compensation for your injuries of loss. Just as theme parks have a lot of money to spend, they have a lot of money available to compensate you for your medical bills, lost wages, pain and suffering and other damages that you have suffered. Typically, they will have large insurance policy limits that will be sufficient to cover even the largest medical bills and monetary settlements. If you or a loved one has been injured in a theme park or amusement park as the result of the negligence of the park or its personnel, a dedicated injury attorney at Injury Law Group will protect your legal rights and ensure that your family obtains the justice you deserve.